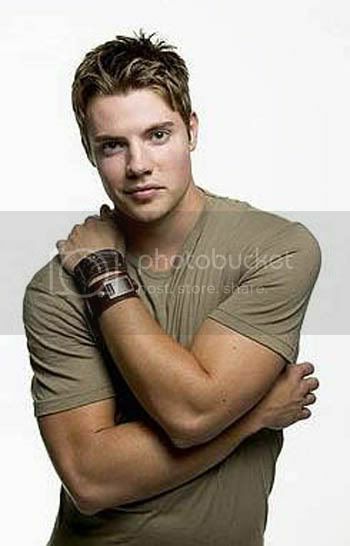 Joshua Baret Henderson (born October 25, 1981) is an American actor and singer. Arguably, his most high-profile role to date has been that of Austin McCann on the ABC hit television series Desperate Housewives. Henderson was born in Dallas, Texas, the son of Sharon Lea Henderson and Mark Anthony Gray. He has one blue eye and one green eye, a condition known as heterochromia. He joined the cast of Desperate Housewives in fall 2006 as Austin McCann, Edie Britt's 18 year old nephew. He is also known for dating pop singer Ashlee Simpson. The couple ended their relationship in late 2003 after dating for two years; their breakup was featured in the first episode of Simpson's reality show, The Ashlee Simpson Show. In 2007, he went on to date Paris Hilton before she was arrested for driving under the influence. On the 2007's edition of Teen Choice Awards, Josh told popular website Just Jared that he has been working on a solo album for three years now. “Still doing Desperate. Then my music. I’ve been working at my music for the last three years. Trying to get a single on the radio before Christmas,” he told on what his career’s been up to. Josh also makes an appearance on Ashley Tisdale's Music Video for her single "He Said, She Said" and "Suddenly."